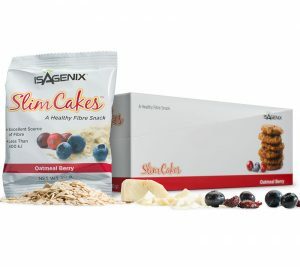 Isagenix Slimcakes - Full of Fibre + Only 90 Calories! Isagenix SlimCakes are the perfect on the go snack. They’re a chewy oatmeal berry cookie packed full of flavour, 5 grams of nutrient fibre and only 90 calories per serving. They come individually wrapped with 14 SlimCakes in a box. Fibre is essential to keep regularity and maintain overall health. Packed with whole oats, inulin, flaxseed and delicious antioxidant-rich berries the Isagenix SlimCakes are to die for! A great snack to throw in your bag and curb your hunger cravings.